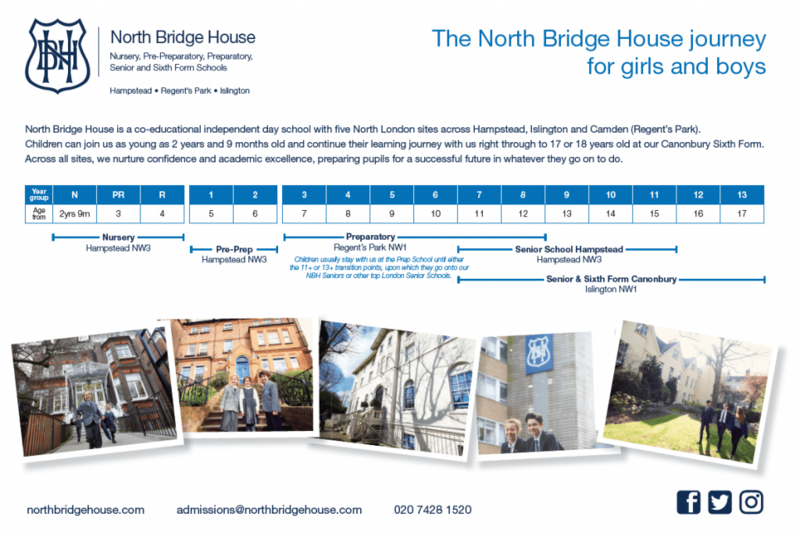 North Bridge House is a co-educational independent day school with five North London sites. Across all sites, we nurture confidence and academic success, preparing pupils for the future in our warm and friendly environment, which ranges from ages 2 years and 9 months to 18 years. At the Nursery School, the Nursery (N) and Pre-Reception (P-R) year groups are the main intake points, with children joining us in the term they turn three or in the September following their third birthday. Reception is the oldest year group within the building and from here, pupils automatically filter through to the Pre-Prep School for Years 1 and 2. When North Bridge House pupils reach the end of Year 2 at the Pre-Prep , they automatically progress to Year 3 at our Prep School, located next to Regent’s Park. At North Bridge House Prep School, we welcome both new and existing pupils at 7+, educating pupils according to their individual abilities and aspirations. In preparing for the next stage of their education, pupils can choose to take one of three routes through the Prep School, and families are carefully advised on the best route and subsequent Senior School for their child. In keeping with tradition, we prepare girls for the 11+ examination and boys for Common Entrance at 13+. We are renowned for the outstanding results our pupils achieve in these external examinations, with the majority gaining entry into their first choice Senior Schools – often with scholarships. These include some of the best Senior Schools in London and the UK, such as North London Collegiate, South Hampstead, Channing, City of London, Westminster, Mill Hill, UCS and St. Paul’s. A number of Prep School pupils choose to progress their education at North Bridge House and continue to benefit from our individualised teaching, small classes sizes and state-of-the-art facilities. Between our two popular Senior School sites, we welcome current and external applicants from 11+. Current and external students join Year 7 at our Senior School in Hampstead, leaving at the end of Year 11. With impressive GCSE results, students either continue onto our Sixth Form at North Bridge House Canonbury or join a number of other successful Sixth Forms. Current and external students join Year 7 at our Senior School & Sixth Form in Canonbury, leaving at the end of Year 13 having completed their A-Levels. Click to expand the image below and see how the journey could look for your child.